We have photo sessions for two more families. To celebrate the holiday season, the PACE Foundation is offering professional photos with Santa for children with special needs in a relaxed, welcoming atmosphere. Professional photos will be taken at the Project PACE, Inc. office (see address below). We understand that when a family member has special needs, photos with Santa at the mall may not be possible. For our Special Santa event, each family will have 15 minutes with Santa so that your family can get the photo you want. Your family will be scheduled for a specific block of time, so there will be very little wait time. Our professional Santa happens to be a father of a son with autism. So, Santa is particularly sensitive to your family’s special needs. A professional photographer will be on-site and you will receive a 4×6 photograph of your favorite shot. Within 3 days of your Santa photos, you will also receive a digital JPG of each photo taken. You are welcome to use this digital JPG to create holiday cards and gifts for friends and family. Please forward this to anyone you think might be interested in Photos with Santa. WITH KATHI CALOURI IN ADVANCE. $50 payment to PACE Foundation. Each family will receive one 4×6 photograph of the photo of your choice AND the JPG digit images of every photo taken to use to create holiday cards and gifts. The PACE Foundation provides scholarships to families attending PACE Place Immersion Workshops and the PACE Place Family Immersion Week. Our professional Santa has generously donated his time. 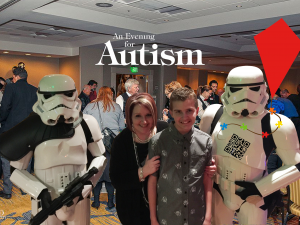 This entry was posted in Autism Activities, Fundraisers. Bookmark the permalink.